Indicates that service processor can be removed during a hot-service operation. Indicates that service is required. Check the /SP/logs/event/list to determine which service processor failed and which service processor became active. Off – Service processor is not running. Steady on – Service processor is powered on and running under ILOM. Note - On the server's rear LED panel, two amber Fault LEDs light while the service processor is booting. The system Fault LED and the service processor Fault LED are normally on during boot. The fault LEDs should turn off and the OK LEDs turn on after the service processor boots without errors. Note - On the server's front and rear LED panels, the green SP LEDs remain on until the server is powered off. 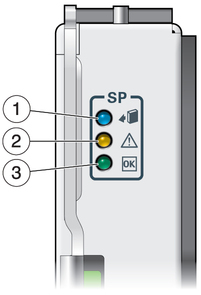 If the front and rear LED panels light both the green SP and amber SP Fault LEDs, check the LEDs located on the service processor boards for the true status of the service processors.